For maps of the history of Europe: Atlas of European history. Europe is one of the seven traditional continents of the Earth. Physically and geologically, Europe is the westernmost peninsula of Eurasia, west of Asia. Europe is bounded to the north by the Arctic Ocean, to the west by the Atlantic Ocean, to the south by the Mediterranean Sea, and to the southeast by the waterways adjoining the Mediterranean to and including the Black Sea and the Caucasus Mountains. On the east, Europe is divided from Asia by the water divide of the Ural Mountains and by the Caspian Sea. 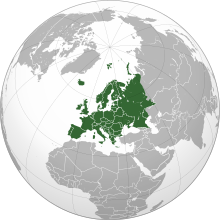 Europe is the world's second-smallest continent in terms of area, covering about 10,400,000 square kilometres (4,010,000 sq mi) or 2.0% of the Earth's surface. The only continent smaller than Europe is Australia. In terms of population, it is the third-largest continent (after Asia and Africa) with a population of some 710,000,000 or about 11% of the world's population. 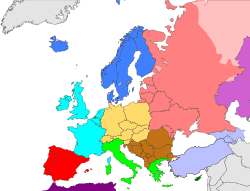 However, the term continent can refer to a cultural and political distinction or a physiographic one, leading to various perspectives about Europe's precise borders, area, and population. Deutsch Europa ist das westliche Fünftel der eurasischen Landmasse und wird historisch und kulturell begründet meist als eigenständiger Kontinent betrachtet, obwohl es eigentlich ein Subkontinent ist, der mit Asien zusammen einen Kontinent bildet. Insgesamt hat Europa eine Fläche von etwa 10,5 Millionen Quadratkilometern und ist damit nach Australien der zweitkleinste Kontinent. Dennoch besitzt Europa mit rund 680 Millionen Einwohnern mehr Einwohner als jeweils Australien, Nord- oder Südamerika. Die geografische Ausdehnung erstreckt sich nach gängiger Definition vom Nordmeer und dem Atlantischen Ozean im Norden und Westen bis zum Ural und Mittelmeer im Osten und Süden. Der Kontinent besteht zurzeit politisch aus 46 souveränen Staaten. 27 davon sind Mitglied der Europäischen Union. français L’Europe est considérée comme un continent ou une partie de l’Eurasie (péninsule occidentale), voire de l’Eurafrasie, selon le point de vue. Elle est parfois qualifiée de « Vieux Continent » (ou d’« Ancien Monde »), par opposition au « Nouveau Monde » (Amériques). русский Европа — часть света, образующая вместе с Азией материк Евразия (о сухопутной границе Европы смотри Азия). italiano L’Europa è una penisola, parte occidentale dell'Eurasia. È comunque considerata un continente per motivi culturali. È un continente piccolo la cui superficie misura solo 10.400.000 km² (superiore soltanto all'Australia), popolati tuttavia da 799.000.000 abitanti (statistiche del 2003) che la portano ad essere il terzo continente più popolato (dopo Asia ed Africa), pari dunque ad un ottavo della popolazione mondiale. More images Europe - Europe (Category). The maps of the history of Europe can be found in the Atlas of European history.